Monitor network hosts and services on a visual map. Get MAC addresses, scan TCP and UDP ports, and be notified when devices turn on or go down. 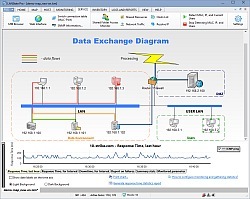 Create network diagram and watch your network state in a visual form in the real time. The program includes a number of features for administrators such as sending messages, shutting down and turning on remote computers, ping, name lookup, trace routing, obtaining information on remote computers, creating reports, etc. LANState does not require installing any client software on remote computers on your network. 1. Modeling a local area network diagram in a visual mode and then saving the result as a map with images. 2. Monitoring hosts (ICMP ping and connecting to TCP port are supported as well as 40 other checks and network protocols). 3. Monitoring usage of your shares by other users of the network. 4. Monitoring load of your network card (incoming/outgoing traffic). 5. Searching hosts by ICMP ping or scanning TCP ports. 6. Retrieving computer's network name by its IP address. 7. Notifying on events by playing a sound, writing to log, running program, sending e-mail, SMS, etc. 8. Performing actions on devices via the configurable map context menu. 9. ICMP, TCP/IP, DNS, ARP, MAC, SNMP, WMI, Syslog monitoring, etc. Change your Mac Address in seconds! Scan Mac Address within any range of IP address. Exports the scanning results from a Mac Address Lookup list. Change the Mac Address of your network card to any new Mac Address. EDraw Network Diagrammer is a professional network diagramming software with rich examples and templates. Easy to draw detailed physical, logical, Cisio and network architecture diagrams. LANView is a powerful tool for LAN administration. It can rapidly gather the hosts' information in the network, With LANView, capturing and analyzing network packets real time would be convenient.